Q: What was your favorite part about working for the North Carolina Coastal Federation? Of being an AmeriCorps member? A: My favorite thing about working with the federation has been getting to work with a great group of people and helping with different projects. I’ve really enjoyed being able to do a variety of things that I can then tie into the education programs that are my main focus. The great thing about being an AmeriCorps member is having a network of people throughout the state. The program has given me so many opportunities to visit and learn from other members and go to professional development trainings; I never imagined I would get to experience so much in just a little over a year. 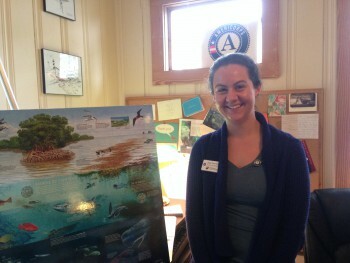 Q: What would you say to someone who is interested in conservation work through AmeriCorps? A: AmeriCorps is a great way to learn about conservation work and get hands on experience at a nonprofit, especially since it can be hard to find a job in the conservation field. The Conservation Trust for North Carolina AmeriCorps program was perfect for me because it had a focus on environmental education, and I was able to gain work experience and professional development in that field, while learning about coastal conservation efforts here in North Carolina. Q: What’s been the most interesting thing you’ve learned during your time at the federation? A: The most interesting or unexpected thing I’ve gotten from this experience is my new-found interest/obsession with marine debris. I really like the idea that we focus on prevention and not just cleanups. I’ve been able to get very creative coming up with ideas to increase awareness about marine debris and I’ve also gotten to use my crafty side! I like talking about marine debris because it’s an issue that everyone is connected to and everyone can play a part in. The possibilities are endless for ways to reduce and reuse items if you put your mind to it! Q: A lot of your work has been focused on education. What makes education such an important part of environmental work? A: Educating the public about the environmental work that is being done is key to gaining support and involvement in the community. By introducing children to the concepts of stormwater management, water quality and reducing marine debris, hopefully we can influence them to think about how their actions can affect the environment. Q: What is something you think everyone should know about the North Carolina coast? A: Everyone should know and remember that we are all connected to the coast no matter where you live. It’s more than just a vacation destination. When we tell people more about the coastal environments around us, it makes them appreciate the coast more as a whole, even if they are just here visiting. Q: What’s next for you, and how has your time at the federation helped you prepare for it? A: I will be moving to Charleston, South Carolina, in June to start working as a marine educator with the Department of Natural Resources. Their programs have a similar focus to the work I’ve been doing with the federation. I am excited to continue teaching programs about estuaries, oysters and marine debris and learn about the restoration projects they are working on in South Carolina. A: There are so many reasons why I enjoyed being both an AmeriCorps member and part of the federation. My favorite part of being an AmeriCorps member was being able to travel all across North Carolina, specifically to do field work in different state parks. I was also able to see western North Carolina for the first time and spend time in Asheville for my AmeriCorps shadowing. I honestly love everything about the federation, but I really enjoyed the restoration work. 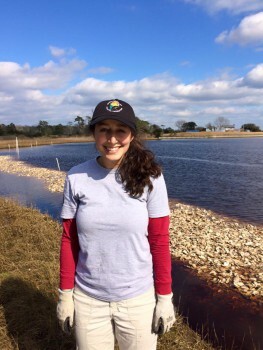 I was able to get great in-the-field experience maintaining oyster reefs, planting salt marsh grasses, doing land surveying and much more through this experience which was all brand new to me. And of course, I love Touch Tank Tuesday! A: My best advice: do it. I was hesitant about the AmeriCorps program when I first started, and I was a little intimidated at first when I was just thrown into everything. However, I figured out that this was the best way to truly learn. I learned more getting my hands dirty and being exposed to the federation’s work in the last 15 months than I did in four years in a college classroom. Not only that, but AmeriCorps has better helped me understand what I want to pursue as a long-term career. A: How cool oysters are! Before working at the federation, basically all I could tell you about an oyster is that it lived in the ocean and looked like a weird booger. I have learned all about the complex anatomy of an oyster, how they improve water quality (for free!) and how oysters are being used in habitat restoration projects. A: Education is a crucial aspect to environmental conservation. Environmental education is important because it instills a sense of appreciation in students of all ages. It inspires people to become better environmental stewards, simply because they have a better understanding of why something happens, or how our actions can impact life on earth. Once people become environmental stewards, they are able to use the knowledge gained to make educated decisions regarding our planet, and can spread more knowledge in the process. A: How incredibly diverse it is. You don’t need to go to the tropics to see amazing marine organisms. In my time at the federation I have seen: pinfish, pigfish, flounder, mummichogs, stargazers, sea robins, pufferfish, blue crabs, stone crabs, hermit crabs, fiddler crabs, whelks, conchs, stingrays, eels, oysters, mussels, clams, scallops, urchins, herons and egrets just to name a few. Not to mention I caught and held an octopus right out of the Intracoastal! There are awesome things to see all up and down the North Carolina coast, you just got to get out there and find it! I have accepted a temporary position with the Narragansett Bay National Estuarine Research Reserve (NBNERR), which is a federal-state partnership part of a network of 29 protected coastal areas. I will be working as a marine science educator, conducting in-the-field environmental programming on Prudence Island in Rhode Island. I will also be able to participate in field research and monitoring; the NBNERR focuses on how sea-level rise affects salt marshes. I will be pursuing more long-term and permanent positions starting in 2018. The federation has allowed me to grow into a more experienced environmental educator, and AmeriCorps has allowed me to gain my NC Environmental Education Certificate. During my time at the federation I have educated close to 4,000 people from very diverse backgrounds about marine science topics. This experience is something I am extremely grateful for, and will continue to be as I advance my career in coastal conservation. The best part about it is that Rhode Island is my home-state, and I am so excited to translate my experiences from the federation to protecting the lovely (and little) state I call home!